A brick oven is capable of an almost endless variety of cooking styles. With almost all types of cooking, you should bring the oven fully up to heat, then prepare it for the type of cooking you want to do by moving the fire and coals, and letting the oven temperature reach the range where you will be cooking. How long you fire your oven depends on how much cooking you will be doing, and how long you want your oven to hold its heat. Remember that you can only take out heat from the oven that you put in. If you are going to be cooking a lot of pizza for a large party, or baking lots of bread or a large roast, fire your oven longer. If you are making pizza for the family for a mid-week meal, you can fire your oven for a shorter time -- typically only until the dome goes white. colour(white is ready-no soot),put your hand inside quickly-too hot to stay and its ready or throw some flour on the oven floor and watch how it behaves-browning rapidly is ready. Fire-in-the-oven cooking (floor temp 300degC and up) is used for baking pizza, pizza-like flatbreads and certain types of appetizers, all of which cook in a couple of minutes. The goal with this type of cooking is to completely fill the floor and dome with heat, build up a large sized bed of coals and maintain a large fire where the flame reaches to top of the dome. There are two ways to know that an oven is ready to cook pizza. First, when the oven dome itself has gone clear, and there is no visible black soot. At this point, you should move the fire to one side, while continuing to maintain a large fire going with the flame reaching the middle of the oven. Alternatively, if you are using our infrared thermometer, the floor should read approximately 300-370º. Pizzas are baked right on the floor next to the fire. Leave the oven completely open, and add wood every 15-20 minutes to maintain a large flame. (Interesting option reduce plain flour and ADD 1 cup (185g) semolina.Semolina gives this pizza base more stability and a crispy chewy texture when cooked. Brush a bowl lightly with oil. Turn the dough onto a lightly floured surface and knead for 10 minutes or until smooth and elastic. Place in the prepared bowl and turn to coat in oil. Cover with plastic wrap and set aside in a warm, draught-free place to rise for 30 minutes or until dough doubles in size.You can prepare this recipe up to 1 hour before serving. 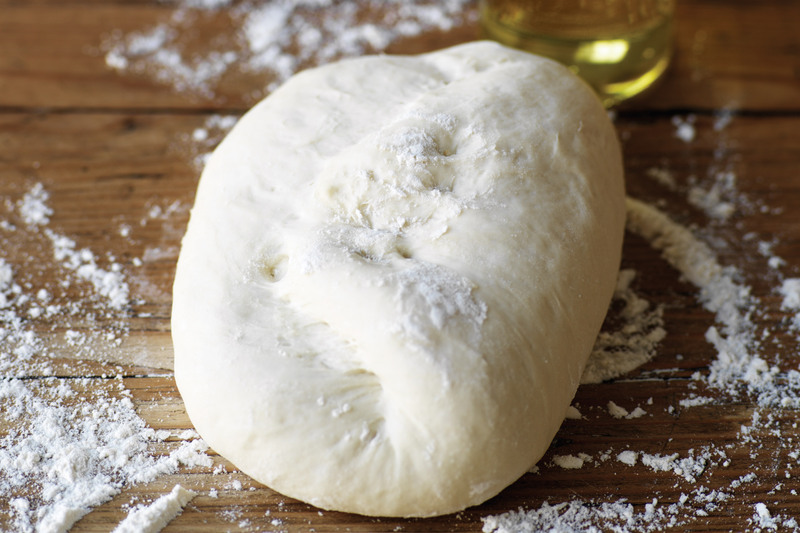 Note.The more you handle the dough, the tougher it becomes.We don't recommend using a rolling pin, which is hard on the dough and will give you a thin,but tough pizza. In fact, the rolling pin is specifically outlawed on traditional pizza making! Try to shape your dough in the air as much as possible, before you lay it on the counter- it will reward you with a pizza that is both crisp and delicate. A good first try pizza-Rosso e Bianco (red and white) Place your shaped pizza dough on a dusted pizza peel, sprinkle the dough with olive oil, enough tomato sauce to cover and a handful of chopped Mozzarella. We recommend that you cook a simple Margherita(red)pizza first, beyond venturing into more ingredients. It gives you the chance to savor the flavors of your wonderful ingredients, and taste the pleasure of a wood fire pizza. It will also give you a feeling for how pizza cooks. If you prefer a white pizza, simply top your dough with olive oil and Mozzarella and cook. Your oven is fired and the cooking floor is clean; you have assembled your first pizza, and you are ready to go. Test to make sure the pizza is not stuck on your peel by moving your peel forward and backward using short jerks - it should slide easily around. If it does stick, lift it up on one side using your fingers, and throw a little flour underneath. Slide your peel back and forth to free the pizza base . If your pizzas consistently stick to the peel, use more flour underneath the pizza dough before you start decorating. Choose a spot roughly centered in the oven, at least 150mm away from the edge of the fire as your target, and slide pizza to that spot. The best way to place your pizza is to push the peel toward the selected hottest spot, then stop it short just short the spot, allowing the pizza to slide off the peel. Pull the peel backward as the pizza slides forward.After about 90 seconds, slide the peel under the pizza and turn it 180 degrees, so that the side furthest from the fire is facing the oven. If your pizza is burning on the fire side you can turn the pizza earlier. After another 45-90 seconds the pizza should be done. The perfect pizza is bubbling on top with completely melted (and possibly slightly browned) cheese, has a brown outer crust, and a dark brown bottle. The crust is crunchy on the outside and soft and delicate on the inside. Everything is steaming hot. Throw on some fresh basil, use a pizza cutting wheel to cut your pizza into eight pieces and you have done it. Combine the tomato paste with the harissa and garlic; using the back of a dessert spoon smooth the tomato mixture over the prepared base; spread evenly. Arrange the eggplant and zucchini on top on the base; scatter with the olives, chilli and caraway seeds. Drizzle over a little olive oil and place in pre-heated oven for 20-25mins until base is crisp and golden. Remove from the oven and scatter with torn fresh mint leaves(growing fresh under table)before serving. Enjoy!! dishes that will cook completely before the outside either burns or becomes too brown. Roasting temperature range between 315ºC - 230ºC, or lower than high heat fire-in-the-oven pizza cooking, and higher than traditional baking. In order to Roast, first bring your oven up to pizza temperature and then allow it to drop in temperature and the fire to burn down, but not out. Push the coals to one side. The combination of a fully fired oven, along with a low fire enables you to sear and brown dishes, and then allow the oven to slowly drop in temperature for longer cooking. There should be no visible black on the dome, a medium sized bed of coals and a small flame of 2"-4" high. The door may be left off for shorter roasting times (under one hour) or positioned inside the arch opening to help regulate the heat for hours of roasting. Add small pieces of wood as needed to maintain temperature. You can move your pans around inside the oven, and remember that the oven will be hotter on the side with the fire and/or coals-so rotate pans. 3 handfuls of fresh herbs (basil, parsley, marjoram), finely chopped-all available in herb area behind BBQ. Put the roasting tray in the oven at 220° C.
Wash the chicken inside and out and pat as dry as possible with paper towels.Rub the cavity with salt. Very carefully grab the skin at the tip of the chicken breasts, making sure that it doesn?t rip, and pull up gently. With your other hand gently separate the skin from the meat of the breasts. Now you have made two little tunnels on each side. Sprinkle a little salt down the gaps and push in the chopped herbs. Drizzle in a little olive oil. Remove the hot roasting tray from the oven and add a little oil. Put the chicken on one side, breast side down, on the tray and put back in the oven. Cook for 5 minutes, then turn it over to the other side, breast side down. Cook for another 5 minutes, then place the chicken on its back. Cook for about 1 hour. The skin should be really crispy and the herbs will flavour the flesh. Make sure the beer can is open, and only half-filled with beer (drink the other half!) If you want, you can put a sprig of thyme (or another herb like rosemary or sage) in the beer can. Lower the chicken on to the open can, so that the chicken is sitting upright, with the can in its cavity. Place the chicken on the cool side of the grill, using the legs and beer can as a tripod to support the chicken on the grill and keep it stable. Cover the grill After an hour, check the chicken and refresh the coals if needed. Then keep checking the chicken every 15 minutes or so, until a meat thermometer inserted into the thickest part of the thigh reads 70°F - 75°C. The total cooking time will vary depending on the size of your chicken, and the internal temperature. A chicken will usually take around 1 1/2 hours.A way to tell if the chicken is done is to poke it deeply with a knife (the thigh is a good place to do this), if the juices run clear, not pink, the chicken is done. Carefully transfer the chicken to a tray or pan. "Carefully" because the beer can, and the beer inside of it, is hot. One way to do this is to slide a metal spatula under the bottom of the beer can. Use tongs to hold the top of the chicken. Lift the chicken, beer can still inside, and move it to a tray. Let the chicken rest for 10 minutes. Carefully lift the chicken off of the can. If it gets stuck, lay the chicken on its side, and pull out the can with tongs. You can also use an open can of baked beans (remove the label) instead of the beer. The chicken juices will run into and flavor the baked beans, which you can then use as a side dish for the chicken. The wood fired oven should be at about 220° C. Lightly brush both sides of the eggplant slices with oil and place on baking dish. Scatter with half the oregano and garlic and season. Bake for about 15 minutes. Turnover, sprinkle with the remaining oregano and garlic, salt and pepper, put back in oven to bake for another 5-10 minutes. 1 handful rosemary, roughly chopped. 10 fillets of salted anchovies or anchovies in oil. and about 10 times randomly about the leg, poking your finger into each cut to make a bit more room. Rub the skin with the lemon and push the rosemary into the cuts and on to the skin. Stuff the anchovy fillets into the cuts. Season the outside of the lamb with salt and pepper. Put a little oil into a roasting tray (preferably a heavy one) and add the lamb. Roast, in a wood fired oven that is about 220° F, turning every 30 minutes until cooked. Baking (260ºC and lower) is used for baking bread, desserts, smaller roast meats, beans and legumes, and pasta dishes at conventional oven temperatures. After fully firing your oven, carefully rake out the hot coals and brush out the oven. If you wish, you can swab the deck with a damp, not wet, towel. Your oven can now cook gently and consistently with the heat retained in the oven dome and floor, as the temperature falls. Using this type of cooking, you can bake either one fully load batch of bread, or multiple bathes of different types of bread, but with smaller quantities. Close the oven door space with bricks etc to hold in heat and steam. into the oven and mounted on a couple of bricks, you can enjoy grilling that sets seared grill marks, and seals in moisture for food that is crisp and not dried out. With heat from the grill itself, from the coals and radiating from oven dome above, the brick oven is a great BBQ. Also, try experimenting with different pots and pans-we have cast iron/enamel Dutch Oven styles available.You could bring others. A grill pan pre-heated in your oven gives food nice sear marks, and a terracotta pan and steel pan give roast potatoes a different texture and flavor. Hungary peppers look sort of like small, squat, deeply ridged red bell peppers. They have a deep, sweet flavor, like red bell pepper concentrated. If you can't find them, substitute pimento peppers or small red bell peppers ? but you will probably need more stuffing to fill them. Cut the tops off the peppers and remove the seeds and ribs from inside the peppers. Place pecans in a dry skillet and toast in your wood oven, tossing occasionally, until fragrant, about 5 minutes. Remove and allow to cool. Break the feta into small chunks and place in a bowl. Add the cherry tomatoes, parsley and olive oil. Roughly chop the pecans and add to the mixture. Season with salt and pepper to taste. Stir well. Stuff the mixture into the cavities of the peppers up to the top. Transfer peppers to a baking dish and cover tightly with foil. Bake in wood oven until the peppers are just beginning to get tender, about 10-15 minutes depending on the temperature. Remove the foil and allow the peppers to continue cooking until the filling is bubbly and golden brown on top. Remove from the oven and serve. Place chunks of the fire roasted tomatoes around the pie and drizzled with olive oil. Build the pizza by placing fire roasted tomato solids on the dough. I left the juice in the can. Tear the mozzarella into pieces and place them around the pizza. Adding some more tomatoes would bring more moisture and an interesting addition of flavor. Special touch: When it came out of the oven, take some more tomatoes and the juice from the can and crushed them in your hands and drizzle them over the pizza. You really taste the flavors of these tomatoes and the first layer is baked and the second is cool. The cool tomatoes will begin to warm right away, but the varying temperature of the first and second layers of tomatoes present slight nuances in flavor. Delicious! Add this to the list of things you gotta try! The fire roasted tomatoes were sweet and delicious, but had another element participating in the flavor dance. The charred bits can be seen right when you open the can and the charred flavor is just a little bit of a deeper note on top of the otherwise sweet and juicy tomato. There is an earthy burnt flavor that almost comes off as "meaty". It's interesting. The salty pancetta with it's own crispy bits from baking, and the somewhat peppery arugula goes well with the sauce! 1. Pick the olives fresh from the tree- we have a few larger olive fruit species (Kalamata) just for preserving. 3. Place in a bucket with fresh water and then change the water each day for 7 days. 4. Make a brine using 100gms of salt to each litre of water (the water level should just cover the olives). 5. Bring the brine to boiling point. 6. Allow the brine to cool for 5 minutes. 7. Place the olives in steralised sealable jars. 8. Cover with the brine, seal and leave for 1 month. 9. Before using a jar of olives, wash off the brine, cover in olive oil, add fresh garlic, fresh rosemary, and leave overnight for the flavours to go through the olives. (Fennel, fresh chill are also nice flavours. 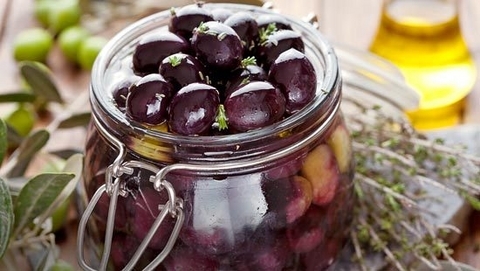 Always keep the jars topped with olive oil to cover the olives).